Here’s our FPL team tips GW33 article where the 1st group of the FFGeek contributors show their teams for GW33. In this part there’s Costas Chari, Rob Cosgrove, Stephen Troop and Sergio Torija. Geek update : A late team arrived from Yaniv. At the end of each commentary I’ve included a transfer summary. Joe has used his free hit chip and has activated his wildcard this week. I’m slowly warming to the fact that there is more opportunity to make large rank gains during a blank gameweek rather than a double. It seems to me that some reasonable planning and a smattering of good fortune can provide a great boost in these weeks as shown by my results last time out. 48 points combined from captain Hazard and Vardy along with a lucky 10 points off the bench from Guaita resulted by in my best gameweek of the season. I now sit at 34k and feel primed to make a late surge up the rankings! 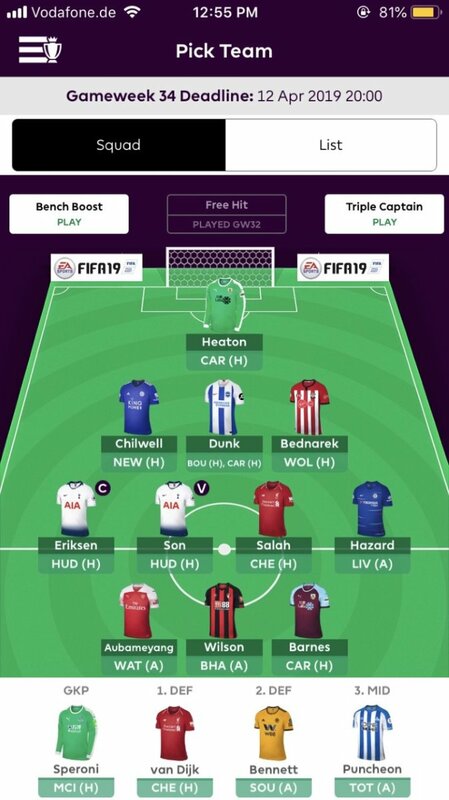 Similar to many others, I have activated my wildcard this week and I spoke about an initial draft in an earlier article. The big change since then is the tragic injury to Harry Kane which has caused a couple of changes in my team. Put simply, I have downgraded him to the in-form Vardy while I also swapped out Rashford for Deeney which allows me to bring in Eriksen to maintain a double-up on the Spurs attack. I wanted Watford attacking coverage for DGW35 given the fixtures while I have gone for Vardy despite the lack of double as he is in the form FPL player right now and I like his next 3 fixtures. Additionally, his price point means he is an easy swap to most strikers; right now it looks a great move to replace him in GW37 with a United striker. The rest of the team is unchanged as I maintain a Brighton defensive double-up while I only include Sterling from the City attack and Mane is still preferred to Salah thanks to the 3mil saving. There is a slight worry about not owning Aguero, but I don’t foresee massive returns during the double, though Vardy is there to be replaced if I get nervous! I do have a slight benching issue this week with it boiling down to choice between Deeney and Laporte – I’m currently playing the striker as I think his ceiling is higher and I hope the cup momentum continues for Watford. Regarding captaincy, it is certain that I will break one of FPL’s unofficial no-no’s. 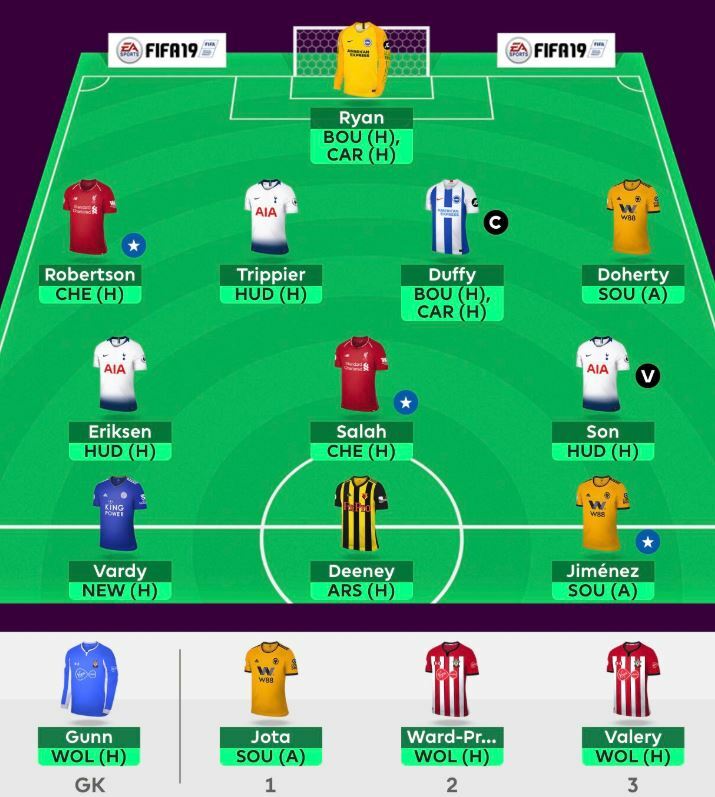 Either I will captain a defender in Duffy or a single gameweeker during a double with Son; currently the armband is on the Brighton man as I like the chances of two clean sheets or even a goal while there could be a slight Champions League hangover for Spurs. It is Huddersfield though… Nonetheless, as it stands the armband is on the Brighton defender – what has the world come to! Good luck this week all and may your arrows be green! It’s a funny old game sometimes FPL. 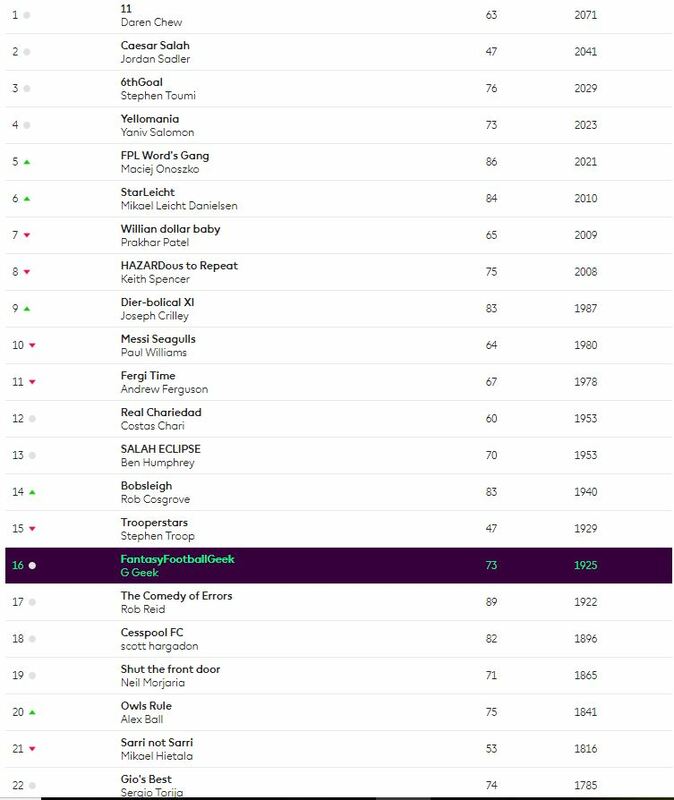 This was the week I’ve been most worried about since I burnt my second Wildcard back in January, I even joked to Geek last Thursday that I’d have been happy to stay in the top 250k in the Overall Rankings. The result? My best gameweek of the season by a mile (indeed one of my best gameweeks of all time in terms of Overall Rank) and a healthy green arrow. And all with only 10 players. Yep, FPL can be confounding sometimes! Let’s have a quick dissection of the latest instalment of my rollercoaster season. I’ve said it before, but you know you’re probably going to be in for a good week when a low price, low ownership player returns for you early in the proceedings. This week it was Hojberg inside 10 minutes on the Friday night, amazingly his second consecutive attacking return. Salah added a lovely individual goal to this, so by Saturday in terms of Overall Rank, I’d made up the -4 to bring Hazard in that I’d decided to take on my lunch break on Friday. Saturday couldn’t have gone much better with 4/4 returns. I was nervous watching the scores come in at 430pm though, Vardy was steadily racking up returns but my double Palace defenders were hanging on just up the road from me at St James’ Park. Then with time running out, Palace got a penalty against the run of play which was duly dispatched by Mili, and despite what seemed like endless injury time they hung on for a 1-0 which ultimately also maxed out the bonus points among my 3 Eagles. Sunday was a bit of a non-event as Kolasinac was hooked after 45 minutes in another dire away performance from The Gunners, but Monday’s highly enjoyable London derby was made even better as my calculated points hit punt on Captain Hazard paid off handsomely with a 32 point haul. So 7/10 returns and a 5 figure Gameweek Rank for what will probably be the only time this season. It’s another big shot in the arm for my Overall Rank and I now have the top 100k in sight, something that looked a galaxy away back in January. The challenge now is to keep the momentum going, with the job for GW34 being to try and hold my rank as best my can while I prepare my team for the Bench Boost chip in GW35. Here’s how I’m going to do it…. It’s all about getting as many double players in for GW35 now and the other big benefit of last week’s score is that I can be a bit more aggressive with points hit knowing I’ve got a bit more leeway. Last week was all about The Eagles for my team, 27 points between the 3 of them so guess what I’m going to do this week? I’m going to sell them all! This may look a bit mad on paper, but there’s method to my madness. First up, they’ve no double gameweek in GW35 so they are of limited use to my Bench Boost chip. Added to this, they’ve got 2 horrible fixtures next – City at home then Arsenal away. I suspect I’ll probably buy Mili back for the end of the season and I’ll be sad to see him go for the moment – he’s got 4 goals and 10 bonus points in the 7 weeks I’ve owned him so he’s certainly been a good investment. I’ll also be sad to say goodbye to AWB, the only remaining player in my squad who I’ve owned since GW1. But there’s no room for sentiment in this game! So my first move is easy – Guaita goes and Ryan comes in. No-brainer this one; my other keeper Foster does have a double in GW35 but plays Arsenal this week (albeit at home so a Watford win does look a good bet) and Ryan has 4 fixtures over the next 2 weeks. He’s in and will start this week. Next up it’s my Mili replacement and with a home fixture against Huddersfield I just have to cover the Spurs attack this week with the added bonus being their double in GW35. Kane’s injury on Tuesday night rather bizarrely has simplified my situation somewhat. He was the obvious captain pick for this week and next so I was getting a bit twitchy on how to cover him, but with him now sadly being out I’m left to pick between the midfield trio of Eriksen, Alli and Son. Eriksen looks the main assist threat, while Alli has had a fairly quiet season returns-wise so far with 5 goals and 3 assists in an injury hit campaign. For me though, it’s got to be Son – he should step in for Kane at centre-forward and although he’s heavily outperformed his stats this season, he looks to be coming into some good form again. He’s in for a -4. Now a controversial third move to make it a -8 this week, but I think it’s worth a punt. It’s goodbye to the faithful Aaron Wan-Bissaka with a Brighton defender coming in. Looks a bit of a crazy one for a -4, but I think it’s worth it for their 4 games over the 2 weeks. If I bring one in this week and he plays all 4, I kind of see it as his appearance points covering the hit with any returns a bonus. It’s between Duffy and Dunk for this pick – they look the most gametime secure. Duffy seems to have more set piece threat, but Dunk is 0.3m cheaper which could come in happy at the business end of the season. Tricky call, but I’ve gone for Dunk here. If nothing else, if I put him alongside Virgil Van Dijk it makes my defence sound like they should be in Chitty Chitty Bang Bang! Finally team selection. I’ve gone for Bednarek over Jonny and Kolasinac with Southampton being at home so that’s settled. For captaincy, this looks to be one of the most split weeks of the season! The obvious choice would have been Kane had he been playing but now there looks like a big split between Son, Vardy and even some of the Brighton players! I’ve gone with Son for the moment, but I could see myself switching to either Vardy or even Ryan before Friday’s deadline! I’ll Tweet if I change my mind. All the best for this week folks – may your arrows be green! 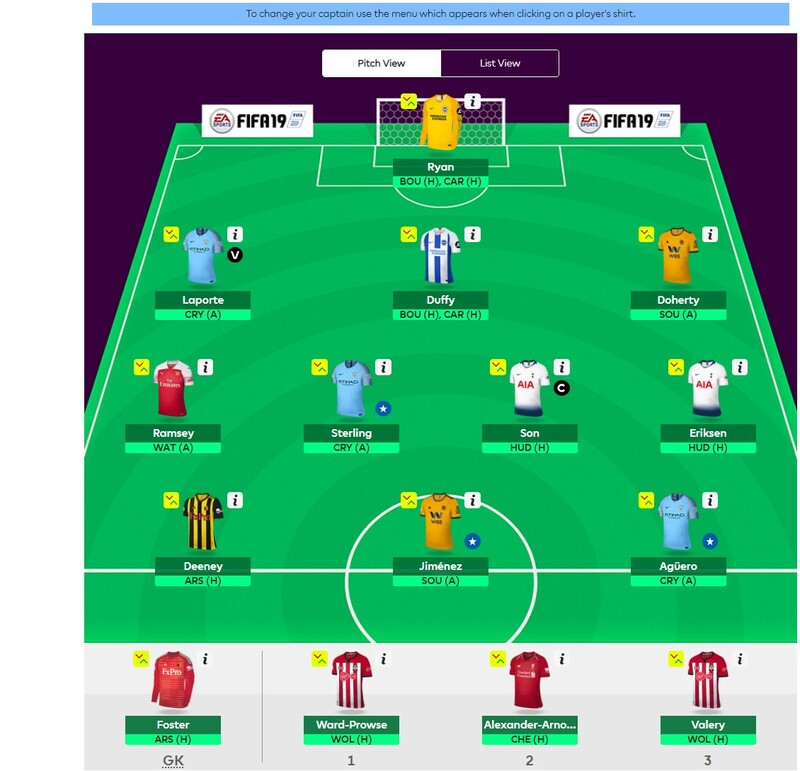 FPL Word has used his free hit and this week is using his wildcard. Costas has used his 2nd wildcard in GW23 and used his free hit chip this week in DGW32. Lots of changes this week (-8) with Mane, Felipe Anderson and Wan Bissaka making way for Eriksen, Son and Dunk. The clearing out of single gameweek players has started and I hope the Spurs pair cover my -8. Fingers crossed lady luck is on our side! A fallback of 16k and back out the top 100k represented a disappointing week. Not owning Hazard was the primary reason as I had slightly improved in rank going into Monday’s game and had Luiz for clean sheet points. I am on my wildcard with the primary focus to get the best double gameweek players and bench boosting for it. All but 2 players locked in. Ryan – 2 double gameweeks with plenty of clean sheet potential. Foster – 2 decent fixtures in the double gameweek so clean sheet potential there. Duffy – 2 double gameweeks, chances of at least 1 clean sheet and stats show potential for attacking returns too. Doherty – whilst all his recent returns have been in the cup I feel he can get double figures at any time so don’t see why I’d get rid for a double gameweek. Laporte – Not the best fixtures but Laporte is safest city defensive cover in what could be a cagey/tight end to their title race plus has the double gameweek. Alexander Arnold – No double gameweek but wanted one of the Liverpool wingbacks for the run in. Sterling+Aguero – the best city attackers (although I think KDB could be a good differential). Son – Spurs have a plum fixture this week, and despite their less than ideal fixtures for the double, Son is always capable of big returns and Spurs still need to fight for a top 4 position. JWP – bench enabler for the double gameweek bench boost. Set piece threat and Southampton are playing well currently. 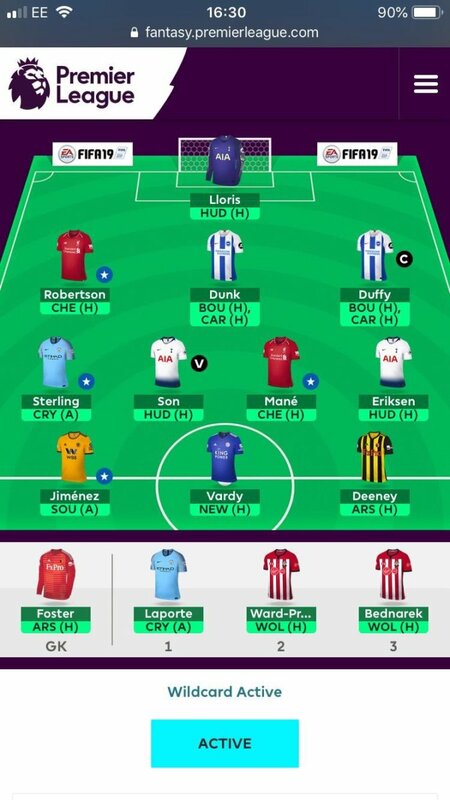 Jimenez – A double gameweek for the in form budget striker. Can’t see a reason to not have him. Deeney – I wanted Watford attacking coverage for their decent double gameweek fixtures. Likes scoring against Arsenal at home too and just think he is a safer option than the midfielders, plus has penalties. Ramsey+Eriksen are the two I’m not a huge fan of but struggling to find an alternative. Pogba is playing very deep and reliant on penalties currently so I have excluded him. I prefer Eriksen to Alli but with Kane’s injury I may change this. Any suggestions welcome. Lee… that team is about as good as it gets. Mine is almost identical. No Liverpool coverage the only concern, particularly with their upcoming fixtures against Cardiff and Huddersfield. Thanks Ian. I think I saw your draft in another thread and liked it. You have bigger TV than me though, I can’t get Mane in. My only issue with the team above is what transfer to make for GW35. 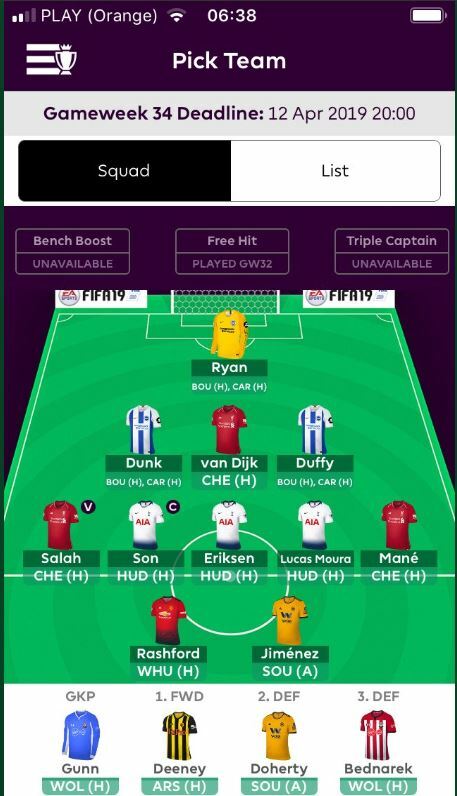 I’d like to get rid of Dunk as don’t want 2 Brighton defenders for my bench boost. But no obvious candidates. Maybe Mariappa. Will have to move Erikson on to get Mane for 36. I think I’m going to ignore all Man city players until gw36. Just look at their fixtures. They have 4 games in 10 days. All vital including champions league. There will be massive rotation and no guarantee of big hails away to palace and United and home to spurs. You could end up with a player playing half a game and rested in the second. whats your alternative? Arsenal players? Christ this WC is so intense and unsettling. I was set on Aguero and Sterling and now that I’m looking at their fixtures from this perspective I’m thinking they’re a massive no-go!! But they score against anyone and have the PL title to play for. Not saying you don’t have a point tho. Any reason why Murray isn’t being considered by more contributors? But could def be worth a punt. plan to do duffy -> kol for GW35 (otherwise i would have jota over deu now). a little concerned over laca, but not sure if i can fit aguero in, unless i do lloris -> ryan, laporte -> kol, laca -> aguero. I had Laca in also but decided against now. Put Aguero upfront and downgraded Spurs midfield to Son & Moura. Planning to downgrade Aguero next week for Auba. Murray out next week for Deeney for GW35. Leaves me with £1.7m ITB and a strong standing for a BB in GW35. I’m thinking of downgrading Aguero to Auba for Arsenal’s DGW after City face Palace which makes me think I should be upgrading someone in the back line to strengthen. Also, I have a ? over Moura but now that Kane’s gone I feel he is a good differential vs. Alli & Eriksen. why aren’te more managers considering Firminho? He enables LFC cover, with Sterling, Son, Erickson, Jota etc. Not a lot of City coverage in these teams I see. Now I am beginning to think that they could be differentials over the next 3 GW’s. City could easily score 6-8 in the next 3 games. Completely agree. After their loss in the Champions League as well they could just turn up and blitz Spurs on the weekend. I’d still back Aguero over any other striker regardless of fixtures. And I am a United fan and I do not see us keeping a clean sheet against st City… so dodgy at the back. And they will definitely score against Palace and Spurs. I’m really afraid of not having my team .. diversified? Great post, but I think Hazard will score vs Liverpool.